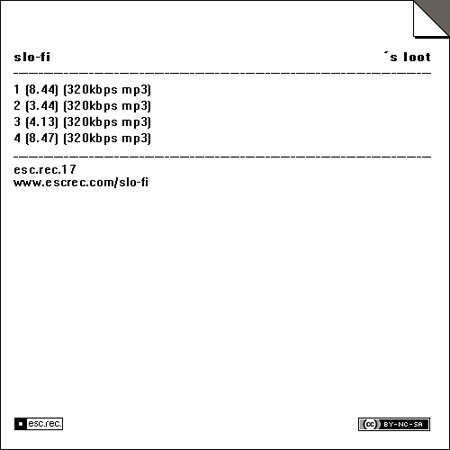 Slo-fi – 's Loot | Esc.rec. Slo-fi does it again. It’s the perfect sequel to the ‘slo-fi’s latest hits’ release. High quality, subtle, layered techno, released through esc.rec. as freely downloadable files, encoded in the highest possible quality for your listening pleasure. How nice is this album. Slo-Fi’s latest hits-album was a real joy, now this one is even better! Thank you Harco, for releasing this masterpiece.